A variety of medical procedures require the use of chilling mechanisms. Many surgeries and procedures require removing heat from body parts or lowering a person’s body temperature, like laser surgery, hair and tattoo removal, vein treatments and laser eye surgery. Orthopedic rehabilitation and hypothermia procedures also use custom medical chillers for cooling down thermal pads after use. Medical machines like MRIs, PET and CAT scans, linear accelerators, lasers and x-ray machines generate a large amount of heat, and must quickly cool down in order to work properly for an extended period of time. Large chillers are used to better control the temperature after one of these machines is used, to prevent overheating. One of the most common medical chiller applications takes place in laboratory testing. Often, blood samples undergo testing and must be cooled down to a certain temperature. They are placed in smaller chillers to obtain the desired temperature. Medical chillers may be small cabinets that fit blood samples and small instruments, or large enough to cool down an MRI machine. Hospitals use large, central chillers that are in integral part of a room and combine many heat exchangers and external cooling towers. 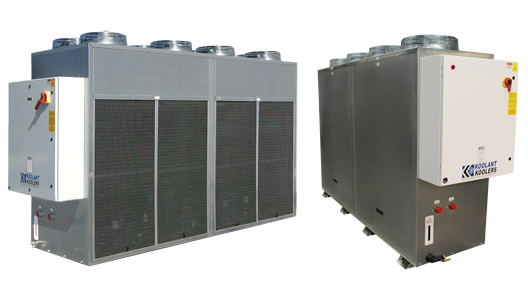 They are dedicated-process chillers, meaning they operate year-round and are designed to provide specific, capacity-matched cooling protection and proper temperature and water flow, since they are used so often. Their housing is insulated and generally constructed of a reinforced metal like aluminum or stainless steel. Other components may include a thermoelectric cooling engine, liquid reservoir, pump, power supply, temperature controls, an enclosure and wiring. They often offer higher pressure pumping, temperature stability and microprocessor controls. Medical chillers cool temperatures by passing a refrigerant gas through a heat exchanger while a liquid flows in the other direction on the opposite side. The gas absorbs the heat lost by the liquid. The air is cooled, and moved by a system of fans around the facility or within the cabinet. The liquid is then transformed into a very cold mist. Medical Chillers Chiller refrigeration systems are used many different ways within the medical industry. They reduce the temperature of medical equipment, machines and even patients for various procedures within hospitals, med centers and doctors' offices. They are self-contained and use thermoelectrics to maintain a consistent temperature, and they are mostly dedicated-process chillers.